Jessica stood across the street from the 59th Street RKO. She hesitated over crossing, pulling up the collar of her tightly belted mac to cover her dark hair, unprotected by her black berét. A silver pin, in the form of an arrow, nestled at a jaunty angle in the berét. The inexpensive bit of costume jewelry was her good luck piece. The pin seemed effective – well, 45 to 60% effective. Accurately estimating the efficiency of any good luck charm was always difficult; no one ever remembered all the times one didn’t work. It had better work today. Crawford’s instructions, circled in her newspaper, had directed Jess to meet him at this theatre for the first matinée – more precisely, meet him in center aisle, row eight, four seats from the left. She’d burned the paper afterwards, wondering why he hadn’t advised her to do so. Her luck had held out pretty well so far. Liz, who had been maniacally on her doorstep since Peter had gone out of town, first, for a week’s business trip, then, for a few days at some Hibernian Society meeting, had not called or put in an appearance today. Over the past few days of Elizabeth’s encampment, Jess had managed, by the skin of her teeth, not to let slip a single intimation of Crawford’s appearance. It hadn’t been easy. Knowing about the package, Liz was getting suspicious over Crawford’s “delay” at getting such a valuable commodity back in his hands. Jess gave the overcast sky a speculative glare. Bad enough the weather had turned so cold this early in September, but the dampness added a nasty, cutting edge. If the traffic weren’t so heavy with the noon rush, the cars would have been tearing up the asphalt, gas shortage or no. Neither consideration was what really held Jessica back, though. She knew the sooner she crossed the street and entered the theatre, the sooner she came to ending this screwball charade. She still didn’t move. Here, in broad daylight, Jess felt disturbingly conspicuous, though no one was supposed to know of her involvement. Well, you won’t look so obvious if you stop standing around like a misplaced statue and trot yourself into the theatre. Abrupt glances to either side, then one over-the-shoulder peek, and Jessica launched herself. Picking her way across the street, the traffic of which had perversely switched from sluggish to homicidal, Jessica sourly lamented Mr. Crawford’s choice of films: Revenge of the Zombies on a double-bill with and an East Side Kids movie. A clever ploy to deter any followers with unspeakably bad cinema? He’d probably show up late, cruelly leaving her to bide her time with Huntz Hall and Leo Gorcey – people who made the Three Stooges look like Noel Coward. Her tickets purchased, Jessica was so preoccupied with events to come that she found herself picking her way down the dimly lit center aisle of the interior without being aware of her surroundings a single step of the way. Eyes adjusting to movie-house twilight, Jess noted the paucity of theatre-goers. Of course hardly anyone would be free this time of day. 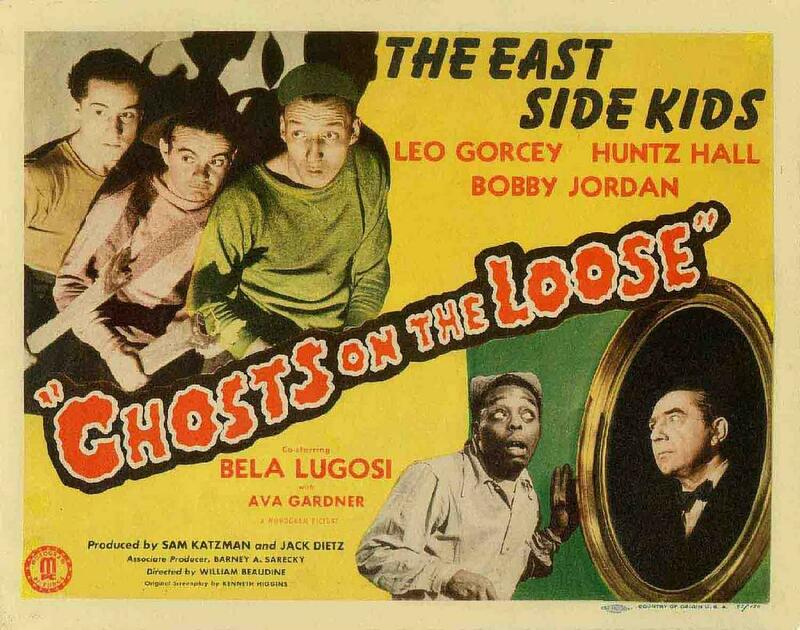 Certainly no one was going to make time for a Monogram horror movie teamed with the East Side Kids. If the pressures of war were really driving more and more people to the movies as a form of escapism, it would take another Pearl Harbor to drive any one to this double feature. Jessica halted, frowning. With only about five minutes to show-time, the theatre was almost bare of people. Just her luck, one of the few places people could be found was row eight; center aisle; seats four, five, and seven. Why she’d been so confoundedly determined not to be conspicuously early? Now she had come up with a plan – pronto! A flashlight shone near Jessica. “Can I help you, lady?” asked the young uniformed usher. Moving down the aisle, Jessica fished a handkerchief from her shoulder bag, bandaged her hand, then hid the swathed hand in her mac pocket. Occupying the three seats were a middle-aged man and a young couple preoccupied with experimenting in advanced biology – their own. For a moment, Jessica’s plan twinged her with guilt; however, the importance of national security and her own preponderance for the devilish took precedence. “It could have crawled off,” Jess mused. “Crawled?” repeated the girl uneasily. “Oh, yes. I was carrying a, uh, specimen my uncle gave me to take to the zoological gardens. I was on my way there, but I thought I’d stop for the top of the double-bill (I was running early). Well, wouldn’t you just know it. I remembered that I had to make a call and had to leave. 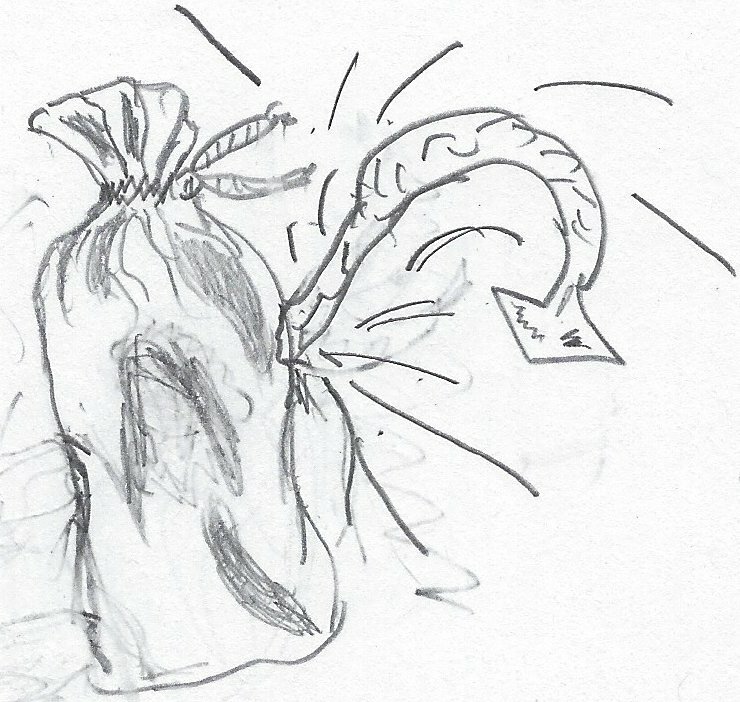 Like a dope, I forgot my package with the little, ah, creature,” Jessica explained affably. “Your uncle gave you an animal?” the girl pressed, humanly fascinated with the prospect of something she knew she’d really rather not know about. “Yes. I guess you could call it that. You see, my uncle likes to breed new things,” Jess finished with a smile of cordial evil. The middle-aged man got up and picked his way warily, but hurriedly, down the opposite end of the aisle. “Oh, hardly at all!” Jessica assured with an expansive sweep of her bandaged hand. “What’s, what’s the matter with your hand?” the girl questioned. The girl’s eyes widened. She and her boyfriend shot panicked looks to each other then nearly battled one another to be the first to escape the seats. Jessica calmly stepped back to let them stampede past, pondering the death of chivalry. She prudently refrained from suggesting they seek refuge in the balcony. Grinning like a canary-fed cat, Jess nonchalantly moved in on her assigned seat. Thank goodness the cartoon came first; she could loose her laughter without attracting anyone’s suspicion. As a matter of fact, the cartoon wasn’t bad after all, even if it wasn’t Warner Brothers. Just as well, perhaps. Her little trick on the two kids left her considering that she and Monsieur Bugs didn’t share a few too many character traits. Now, if only Crawford would get here in time to rescue her from the Dead End Kids. Someone settled in behind her, then another joined the first. No, not Crawford – unless he’d decided to bring a date. Jess settled back into watching the cartoon, briefly considering who would date a spy, anyway. Hmm, maybe Mr. Crawford would bring some pop corn when he showed, which she wished would be soon. Jessica shifted in her seat, pressing her palms together in her lap. Why was her mind, despite all best efforts to the contrary, intermittently niggled by the possibility that if Crawford didn’t show soon, he might not show at all? Would it be selfish to start praying now? Jessica firmly, but not easily, suppressed the drive to crane her neck and sweep her eyes up and down the aisle. Train those eyes squarely on the screen, Madame! Jess jerked her head to the right with a less than pithy, “oh, um,” only just checking herself from blurting, “It’s you!” when Crawford’s expression, barely discernible in the flickering cinema light, signaled her to feign no recognition. He hesitated, only long enough to crook a brief smile, before sitting down. Jessica casually returned to following the cartoon. She hadn’t really looked closely at Crawford, but after he joined her she distinctly caught the scent of buttered pop corn. Before she could think, she inhaled deeply, deliciously. Her stomach growled. “Don’t mind if I do, stranger,” she answered in a low voice, gracefully scooping a handful of popcorn. “Not afraid of encouraging a masher?” he whispered. “It takes more than a fifteen-cent bag of pop corn to seduce me,” Jessica retorted without even turning. The man behind them cleared his throat significantly. Jessica and Crawford fell silent. Of course, it was best not to draw attention to their conversation. Fine. She had no objections as long as Crawford kept the pop corn flowing. She scooped more pop corn and turned back to the cartoon’s wind up. If he offered her popcorn before relaying each nugget of information, she wouldn’t be able to fit into most of her wardrobe by the time they left. From the corner of her eye, Jess could see Crawford’s irritation with her response. Well, too bad. She knew the area he was talking about. Hadn’t she risked herself enough already? She’d be better off taking her chances with the Nazis, or whomever. The closest she intended to get to that part of town after dark was the lower half of this double bill. “I’m not walking down there,” she reiterated calmly. “All right. I guess so,” Jess consented on both counts, still a bit reluctantly on the first. She ate her pop corn slowly, speculatively . Mr. Crawford sank into (to Jessica) a curiousity-provoking silence during the news reel. Maybe he didn’t want to seem too chummy? Not much chance of that since their whispering had degenerated into something less than cordial. The man behind them had delivered them a blatant hint by conspicuously clearing his throat a second time. So how long before Mr. Crawford finished his message? Jess still exactly sold on tramping around the East Side. Unfortunately, it looked to be her only option. The news reel finally having run its course, the opening title of Revenge of the Zombies flashed across the screen. Surveying the credits, for want of any thing better to do until Crawford continued, Jess noted that Monogram had turned out all its big guns for this opus: Veda Ann Borg and Robert Lowery, not to mention Mantan Moreland. With any luck, this might be one of those so-bad-it’s-funny films. Jess hoped. Meanwhile, Mr. Crawford remained taciturn. Uh oh, she was going to be here a long time. “Okay, go ahead,” Jess consented, taking more pop corn. “You’ve been credited with a phenomenal capacity for memorizing scripts, details,” Crawford chided, as if trying to pique or to flatter her into complying with his plans. She wasn’t sure which. Jess was about to question why he hadn’t been quite so circumspect about writing on her newspaper, but a kick at the back of their seats startled her. Apparently, the gentleman to their rear was growing testy with them. Jess instinctively started to shoot him a flip crack, but Mr. Crawford nonchalantly dropped a restraining hand on her arm. Jessica tensed, but she settled back, admitting to herself that neither she nor Mr. Crawford would remain terribly inconspicuous if she gave that character a piece of her mind. Either Crawford couldn’t write very fast in the dark, or he just didn’t like romantic scenes with Mantan Moreland, for he waited until just such a critical juncture in the film to nudge Jessica. “Sorry,” Crawford quickly muttered, slipping the note into Jessica’s coat pocket. Jess’s mouth turned up at the corner, her eyes sharing with Crawford the glint belying his dead pan expression. She settled back into her seat, returning her attention to the movie. Most of her attention. 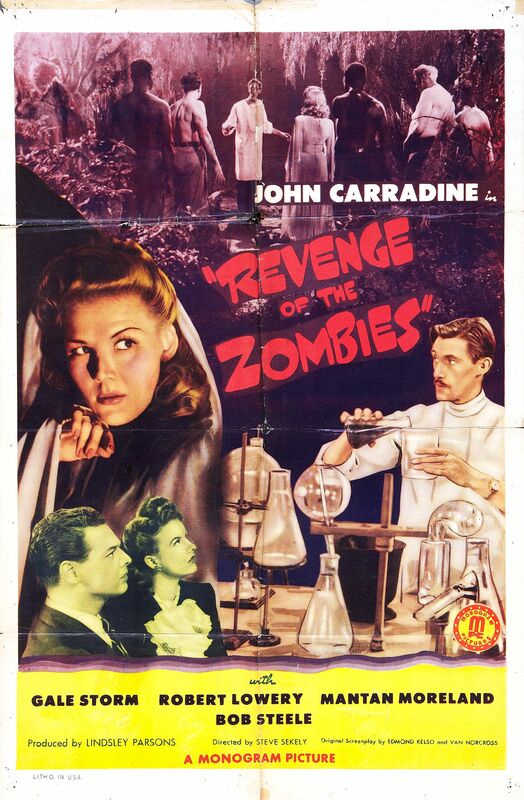 The voice of the cinematic zombie sounded less like a call from beyond than somebody shouting up an elevator shaft. An unpremeditated glance at Crawford, which he returned equally unexpectedly, and they both barely managed not to collapse into rampant guffaws at the God-awful special effects. They both did relax into their seats with mischievous solidarity. Grabbing the bag of pop corn, she dumped it over his head and shoved past him into the center aisle. Jess paused, momentarily horrified at carrying her performance just a shade too far over the top. Crawford pulled the bag from his head, trying to put himself to rights. When he started to turn to her, Jessica instinctively launched herself hastily up the aisle. She could do without that Arctic stare of Crawford’s, especially from under his pop-corn-bag chapeau. By the time Jessica reached the outer entrance of the movie house, she could no longer keep up the complacent façade. Leaning against the glass protecting the film’s oversized display poster, Jessica let the laughter wrack her until her sides ached – and the suspicious appraisal of the woman in the ticket booth caught her eye. Maybe this wasn’t the most inconspicuous retreat on record. Jessica sailed off down the street. Heading for the nearest sub way outlet, Jess forced out of her mind the possibility that Crawford might have been followed to the theatre. A fast walker, Jess didn’t take long to reach her destination. Descending into the depths of the city, Jess scurried along, too preoccupied with digging up a coin for the turnstile to watch where she was going. She knew it all so well. That year and a half on the subway circuit, hauling herself all over Manhattan and Brooklyn in the name of “art,” and a pay check, had indelibly imprinted this underground system of rumbling black caverns on her mind. Jess took a swift, instinctive peek over her shoulder as she shoved through the turnstile; so could she recognize trouble if she saw it? Great! 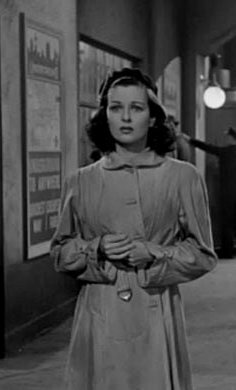 For the first time in all her years in the city she’d inadvertently timed her arrival to coincide with that of the tram, not that there wasn’t a solid mass waiting ahead of her. People were shoving her along the platform, trying to get in before the doors even opened, determinedly oblivious to the fact they couldn’t get on until the disembarking passengers got off. Jessica was beginning to despair of getting on at all when at the last minute she managed to wend and squeeze her way through the crowd and drive forward onto the car. Big surprise! No seats. So, bunched in with a blur of uniforms; blue work shirts; trench coats; and bobbing pompadours, Jess made a grab for one of those hanging straps that could only have been designed with the either the Harlem Globe Trotters or Frankenstein’s monster in mind. Hanging on for dear life, at five feet four inches, Jessica felt like a side of beef dangling from a meat hook. The subway started with what could only be described in understatement as a lurch. At least all these people, crammed sardinelike, cushioned her from falling over. She probably didn’t even really need to hold on to the strap. At least her nose wasn’t level with someone’s armpit, although an assortment of nose-wrinkling aromas did manage to squeeze through the limited air space as the subway rhythmically jounced along like a speedy, lame camel. Then there were pick pockets to consider. She had nothing in her pocket, … except … The car blacked out as the train charged between junctures. Jessica slid her hand over her shoulder bag, into to her pocket, over the piece of paper still there. Her relieved sigh was long enough to raise the eyebrows of the middle-aged double-breasted black suit next to her. Maybe she’d better get off at the next stop. Faster or not, the subway was quickly becoming a less desirable means of transportation than her two legs. Jess needed to walk off her impatience, her uneasiness. When the doors slid open at her stop, finally, Jessica battled her way off the car like a marine landing on Guadalcanal. Only when she reached the top of the stairs and street level did Jessica relax with an exhalation of relief at freeing her restlessness from those cavernous tunnels and claustrophobic cars. Overcast and replete with pedestrians, at least a New York street was something you could move along. 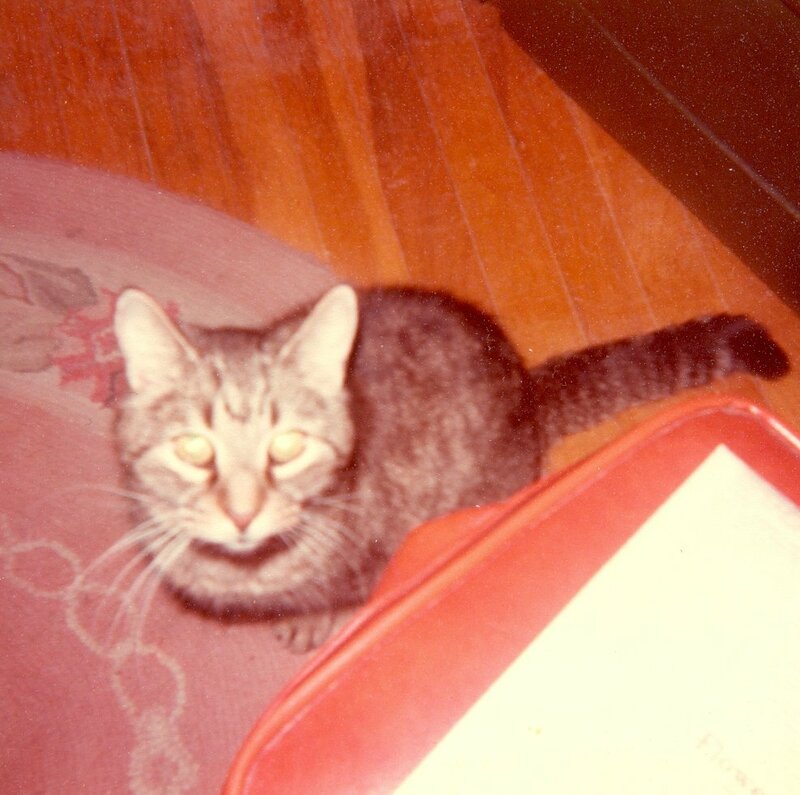 She would be home soon enough, where she could indulge herself in some warming tea, some mellow Glen Miller or Benny Goodman 78s, and the feline felicity of Dusty’s company. Of course, she’d have to endure a catly glare and scolding for abandoning a poor defenseless creature for so long, but Jess was confident she could buy off Dusty’s conscience with a few scoops of tuna. Turning up her collar against the chill and mist, Jess considered this would be the perfect afternoon to curl up with a nice, exciting . . . . heck, anything but a mystery! 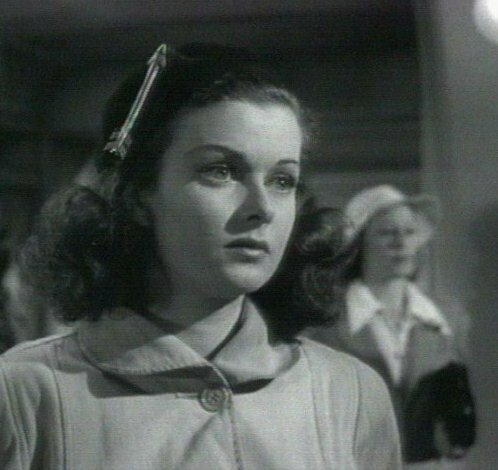 Joan Bennett from Manhunt© 1941 Twentieth-Century Fox.